Sometimes people complain that church buildings are richly and elaborately decorated. In the season of Easter, John Henry Newman reminds us of the reason for this: churches are symbols of Christ, Who is the same yesterday, today and forever. In a sermon titled, “The Gospel Palaces,” Newman reflects on the words of Psalm 78: “He built His sanctuary like high palaces, like the earth which He hath established for ever.” He calls Christian temples by the name of Gospel Palaces, and notes that in England palaces are compared with cathedrals for their beauty, not the other way around. These temples have been built over long periods of time, and are thus a visible sign of the communion of the saints. They were constructed by men with faith who looked to the future, unlike other men who live for the present and for perishable things. Thus were our Churches raised. One age would build a Chancel, and another a Nave, and a third would add a Chapel, and a fourth a Shrine, and a fifth a Spire. By little and little the work of grace went forward; and they could afford to take time about it, and be at pains to do it best, who had a promise that the gates of hell should not prevail against it. Surely the Churches which we inherit are not the purchase of wealth nor the creation of genius, they are the fruits of martyrdom. They come of high deeds and sufferings, as long before their very building as we are after it. Their foundations are laid very deep, even in the preaching of Apostles, and the confession of Saints, and the first victories of the Gospel in our land. All that is so noble in their architecture, all that captivates the eye and makes its way to the heart, is not a human imagination, but a divine gift, a moral result, a spiritual work. The Cross is ever planted in hazard and suffering, and is watered with tears and blood. Their simplicity, grandeur, solidity, elevation, grace, and exuberance of ornament, do but bring to remembrance the patience and purity, the courage, meekness, and great charity, the heavenly affections, the activity in well-doing, the faith and resignation, of men who themselves did but worship in mountains, and in deserts, and in caves and dens of the earth. A twentieth-century saint, Josemaría Escrivá, reminds Catholics that anything that we do for the material aspect of the worship of God is little. It is fitting that churches be beautiful and magnificent because they are the image of the substance which is heaven. And in the material care of churches and chapels, and the charity of our lives, we must keep in mind Jesus’ teaching to the Samaritan woman: we must worship “in spirit and truth” with the hope of doing so one day in the heavenly Jerusalem. Perhaps we can close this reflection with two questions: What can I do to embellish my parish church and promote sacred art? How can I better worship God through my daily work and at Holy Mass? Great message about how to understand the elaborate architecture of our churches – they are reminders of Heaven and built by the devout in Christ’s name. Where is the church in the photo and what is its name? It represents the message of Blessed Cardinal today very well. Thank you Carol. 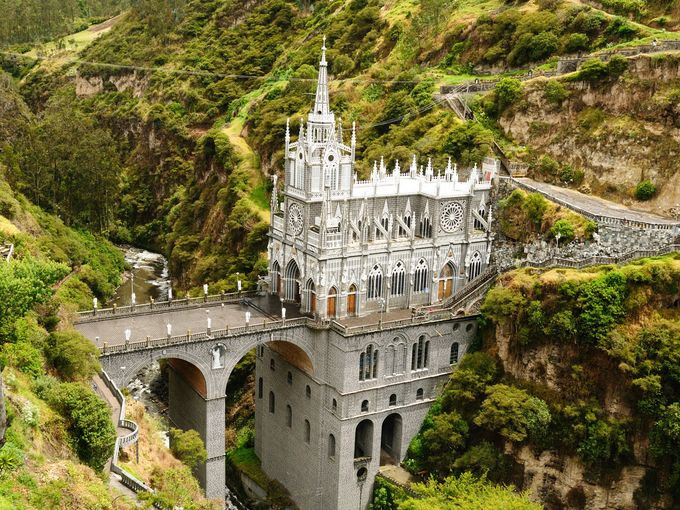 The church is Our Lady of Las Lajas in Ipiales, a location in Nariño, Colombia. It was built in the first half of the 20th century at a place where a woman and her daughter, during a storm, saw a miraculous image of the Virgin Mary in 1754. I love the grand architecture of some of our churches, especially ones throughout Europe that have stood there for so many years. I like thinking about the men who built them and their thoughts each day and year as they worked to construct such amazing churches. 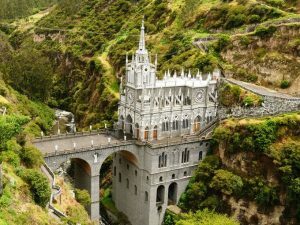 Churches were “constructed by men with faith who looked to the future”, probably knowing that what they were building would not be finished in their lifetime, that they would never get to enjoy it, but they took painstaking steps and great detail to build these places on earth that would most resemble heaven. Yes, they built it for God. Because God always sees the details of our offerings and sacrifices. . . while “men who live for the present and for perishable things” overlook such details. Thank you for the reminder to look at the beauty in our churches and sacred art. . .and to say a prayer of thanks for those who helped to build them. Today I was looking at the photo of a beautiful church in Chicago and thought what you have written. A church should reflect the beauty of God, and lead men to God. It is an offering to God of all that men have.